Okay, I admit it: I'm becoming an expert at renting human beings in Japan. Over the past two years, I've rented a Japanese homeless man, a family, and a NEET—a young person who is "not in education, employment, or training." And now I've rented two ossan, a.k.a. 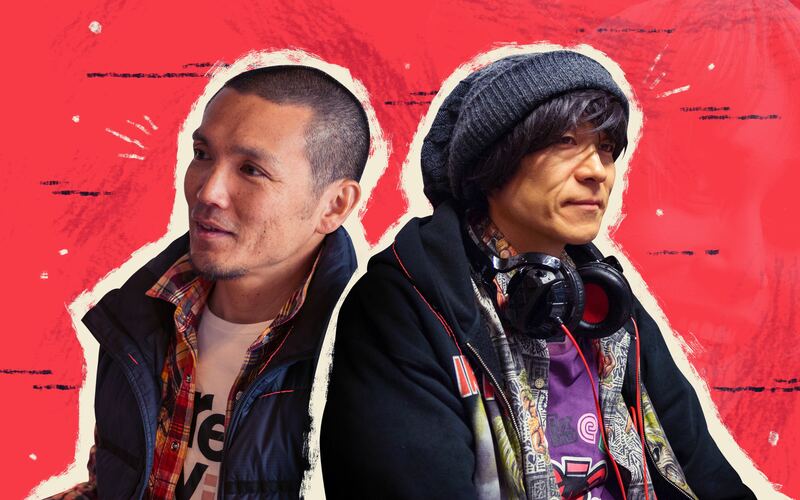 middle-aged Japanese men, via a company called Ossan Rental. The first was Omocha-kun, a music-loving man with a puppet that sings national anthems. The second was Yasashii Shufu, a gardener whom we took cosplaying in Akihabara. Both of their stories were interesting, but this article is about the Ossan Rental service in general. I'll answer such questions as "Why the hell would you want to rent a middle-aged man?" and—well, that's probably the only question you have. Why Rent a Japanese Middle-Aged Man? Just because something exists doesn't mean people actually want to use it. Yet Ossan Rental has gained niche fame on the Internet ever since CEO Nishimoto Takanobu started the service in 2013. Ossan Rental has appeared in a flurry of Japanese newspapers and blogs, as well as in the occasional international story. Why not? No headline reads better than "In Japan, you can rent an old man." That's not why Mr. Nishimoto started Ossan Rental, though. According to legend (and one of his interviews), the future CEO overheard a schoolgirl on a train one day, saying she thought ossan were creepy and always giving lectures. At that moment, he decided to prove to the world that ossan can be cool, too—and a middle-aged empire was born! He rented himself out first, then began adding others after a few months. He doesn't just let in any middle-aged dude off the street, though. He vets each candidate in multi-hour-long interviews. If he's satisfied, he tells them, "You really do look like an ossan!" According to Mr. Nishimoto, if the ossan has a bad reaction to this, they're out. Only one in fifty applicants make the cut, which means everyone on the site is prime middle-aged man material. By 2016, the service was getting around a thousand requests for ossan a year, and it continues to grow. Complaints are few—usually things like "the ossan was late" or other innocuous stuff. The ossan must pay roughly US$100 to be listed, so they have to be pretty serious about it. The Tofugu crew drinking with our rented ossan. Only one in fifty applicants make the cut, which means everyone on the site is prime middle-aged man material. A comedy duo rented two ossan to pose as fans at a competition, then give them good reviews and vote for them. One of our ossan was rented previously to just listen to someone who was considering suicide. By being supportive, he was able to make that person feel better about life. One ossan was hired to pretend to be the customer's ex-husband. She wanted to make her current boyfriend feel jealous so that he would ask her to marry him. She ended up confessing to all this, and the two are currently happy together…inexplicably. One ossan was rented to attend a girl's party as a sarcastic guest. One girl rented an ossan to get an honest opinion: she wanted to become a TV talent and needed an outsider's perspective. One woman, who loved spicy foods but didn't have friends that did, hired an ossan to eat spicy foods with her. One young man was nervous about telling his father that he was getting married, so he hired an ossan—Mr. Nishimoto—to pretend to be his dad so he could practice and gain confidence. One woman who was very sick and unable to eat normal food, when told by a doctor she didn't have long to live, hired an ossan to happily eat different delicious foods in front of her. A war widow rented an ossan to have someone to talk to about her deceased husband. 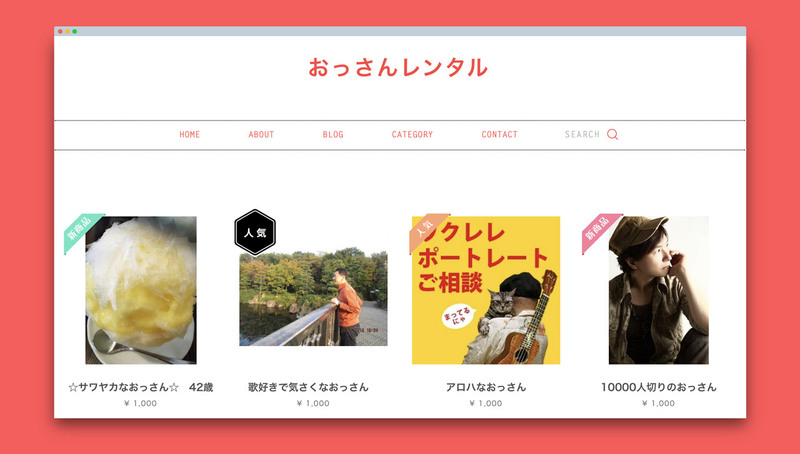 Hire an ossan to show you around a city, neighborhood, or landmark. 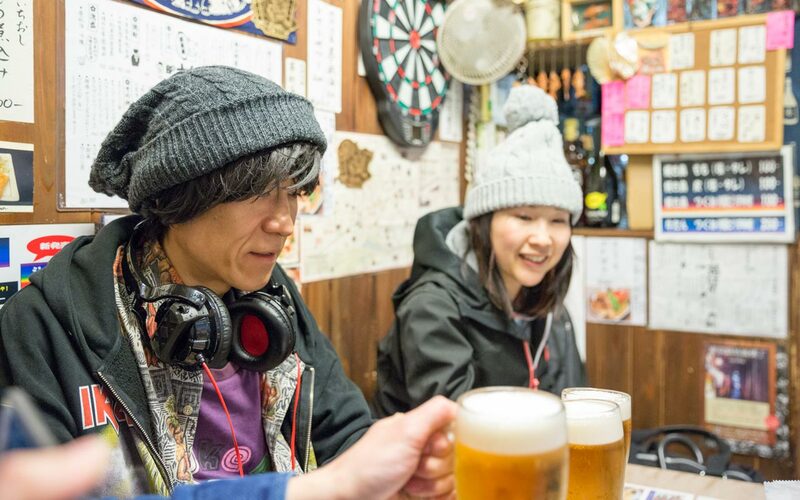 Hire an ossan to learn about real, out-of-the-way, local places. Hire an ossan to shadow so you can get a taste of his regular, everyday life. I think this list is pretty good. Just meeting people is rewarding by itself, even if you're paying them to do so. You could hire an ossan to just hang out and talk with you. ￥1,000/hour is a steal compared to how much it costs to hire a tutor or a speaking partner. If you're not from Japan, you could hire him to help you with your visa/government paperwork and other official things you may not be familiar with. Hire an ossan to provide outside advice on work/school problems you're having that you don't want to bring up with people you know. You could hire someone to draw you—poorly, most likely—to great comedic effect. I'm sure you can come up with all kinds of additional ideas on your own! One thing I noticed was that both ossan were really easy to talk to—they were both great at conversing, and their personalities were definitely unique. When renting our two ossan, our main goal was to interview them, both about their lives and about the Ossan Rental service. You can read those interviews here and here. But we had normal reasons, too. We rented Omocha-kun, our first, to take us around Harmonica-Yokocho, a drinking district in West Tokyo. Our second, Yasashii Shufu, we hired to do cosplay with us. And while the second experience was the most fun, both ossan exceeded our expectations. One thing I noticed was that both ossan were really easy to talk to—they were both great at conversing, and their personalities were definitely unique: outgoing and unusual in contrast to the homogeneous public personality of a typical Japanese person (although I suppose you'd have to be unique if you wanted to rent yourself out to random strangers). For our ossan, things never really felt awkward, and we had lots of interesting interactions and conversations with them. Yasashii Shufu especially was a lot of fun. 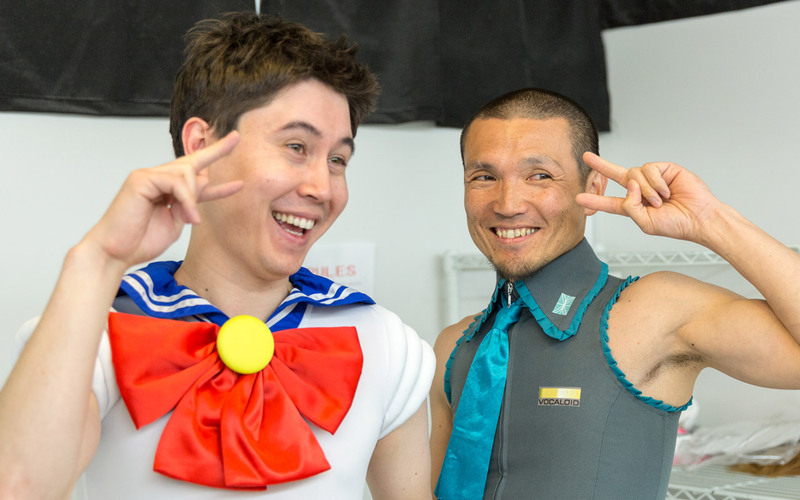 I quickly felt as though we'd become friends, joking and having a good time while the folks at Studio Crown (the cosplay studio we went to) put makeup on us. Afterward, he offered to drive some of our team around Tokyo during the weekend free of charge. So I think the feeling was mutual. Although we only had time to rent two ossan, I wish we had rented more. I mean, check out some of these options! An Ossan is Easy to Rent! Ready to hire your very own ossan? 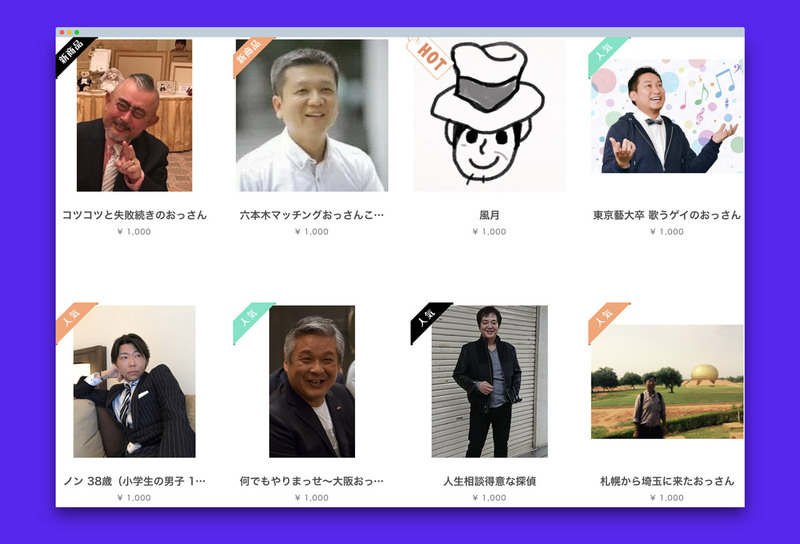 All you need to do is click to the Ossan Rental website and choose the middle-aged Japanese man of your dreams. Add him to your cart. Choose the length of time—selecting "1" gets you one hour, "2" gets you two hours, and so on. Make your payment, which sends a request for confirmation. Once it's accepted, you'll be able to schedule your meeting with your ossan. If you hang out longer than you've paid for, just pay him the extra directly. The most telling thing with any review is the question: would I do it again? For Ossan Rental, the answer is an easy one: yes! Although every situation will be different when two personalities come together, I believe renting an ossan is certain to be an interesting experience, and possibly a rewarding one. Give it a try, and let us know how it goes! Although results will vary from ossan to ossan, I want to use this service again and again to meet new people. I feel comfortable and confident that it will be an experience almost every time, as long as expectations are set beforehand. I think it is an interesting concept and can see the purpose in it. The service rendered was very laid back. Each Ossan experience will be different, but I think this is a great service. When I first heard of it, I thought it was a joke to get attention on the Internet. But when I learned more about it, I found it was actually a very useful service that can help people. Like Koichi said, the Ossan sometimes listen to people who have problems but can’t tell anybody else. I think this could be life saving for some people. I also came across a blog post by a person who used Ossan Rental when she had to have a surgery. She needed somebody to be with her when she had the surgery, but she had no family or friends, so she rented an Ossan. She said that the Ossan was very supportive, and it was very helpful. The name of the service might sound like a joke, but people use it pretty seriously, and I think that is why it has been a real success. Vetted for quality and personality. You can rent them for almost any reason. That variety makes it really interesting. You don't really know what you're going to get. They are human after all.